I often wonder, which is harder: exhibiting refined technique accrued from years of study, or grooving effortlessly to a beat with natural grace and impeccable rhythm? The answer depends on whom you ask. As I watched Ronald K. Brown’s “Evidence, A Dance Company” on March 9 at the Ahmanson Theatre, this question popped into my head. The 10 dancers on stage demonstrated hard-earned, well-polished talent. Leading the charge, however, was their mastery of establishing a visible connection with the music, of riding the tempos with soulful impact. This seems to be part of the choreographer’s mission, and kudos to Brooklyn-based Brown for combining vernacular with modern, African, Latin American and Caribbean dance. Brown’s work has one foot firmly rooted in the past, while the other is in step with the present. 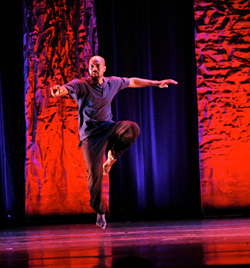 Proving himself a risk taker, he chooses to elevate everyday movement to the professional stage. A dance instructor recently informed me his own teaching process relies on his students’ intelligence upon arrival in his classroom, intelligence they have gathered by experiencing life. People see their parents or family members dance, attend religious services, boogie at barbeques or Bar Mitzvahs. Everyday movement can inspire dance — even be dance. The show’s first act, “Ebony Magazine: To a Village” (1996) is a perfect illustration. The audience feels as if it is observing an intimate conversation the dancers are conducting with themselves and each other using body motion in lieu of words. Stevie Wonder’s classic catalog powers the second act: every song in “On Earth Together” (2011). Spectators bob their heads to “Living for the City” and romantically reflect on “You and I.” Brown and his nine counterparts flirt with interpreting Wonder’s music, grounding their movement in real-world reflections. Brown’s work is refreshingly accessible. Some people attend dance to be wowed by physical feats only a select few can do. “Evidence’s” performance offers a more humanistic element. Nothing expresses this more than Brown’s own smile, a wide grin that beams infectious joy and sweet satisfaction. He’s not as young as the rest of his crew (he’s 46), but he exudes a command of his own action and choreography that is unmatched on stage. He owns his work. In “Grace” (1999), the third set, Brown touches on the sacred. Yet I couldn’t help recall how the first act also has a spiritual tone, or that Wonder imbues “On Earth Together” with ethereal vibes. With dance, it can be hard to decipher the line between the secular and the sacred. The celestial feeling of performing or watching dance can make you forget your feet are on the ground. Perhaps Brown was too ambitious in taking on Stevie. Besides a few missteps, Broadway’s “Porgy and Bess” choreographer brings dance down to Earth.